Until the age of five, Loung Ung lived in Phnom Penh, one of seven children of a high-ranking government official.She was a precocious child who loved the open city markets, fried crickets, chicken fights, and sassing her parents. When Pol Pot's Khmer Rouge army stormed into Phnom Penh in April 1975, Ung's family was forced to flee their home and hide their previous life of privilege. Eventually, they dispersed in order to survive. Loung was trained as a child soldier in a work camp for orphans while her other siblings were sent to labor camps. Only after the Vietnamese destroyed the Khmer Rouge were Loung and her surviving siblings slowly reunited.Bolstered by the shocking bravery of one brother and sustained by her sister's gentle kindness amid brutality, Loung forged ahead to create a courageous new life. 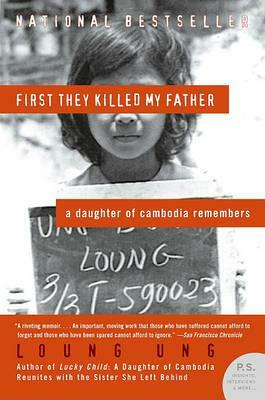 Harrowing yet hopeful, insightful and compelling, this family's story is truly unforgettable.